“Please make three memorial quilts made from my husband’s ties”. That is how this project got started when Doris dropped off a bagful of ties and lots of memories. She wanted all three quilts to be different in design but wanted as many of the ties as possible to be used in each quilt. Originally, we thought the 39 ties would be adequate but soon discovered that each tie, even when deconstructed and opened up, does not have a lot of fabric. 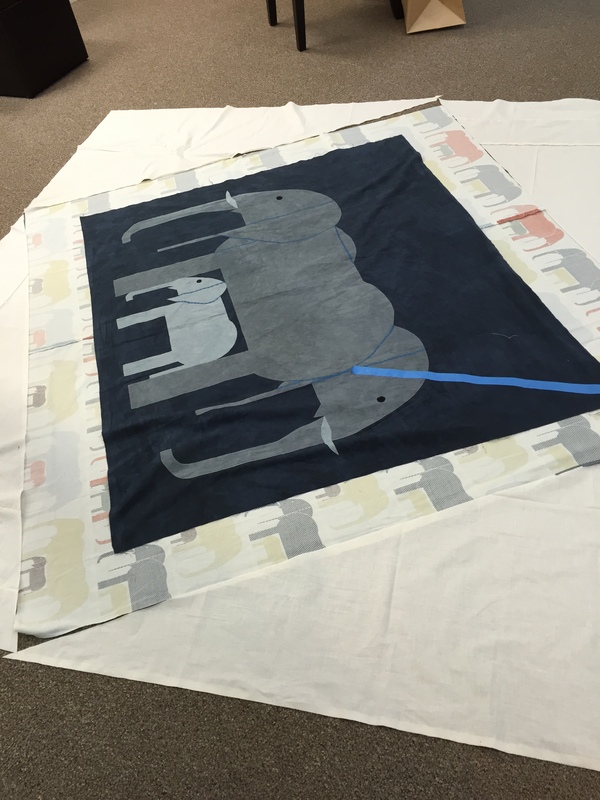 The designs we came up with required the addition of cotton fabric to fill it out. We used a soft beige complementary color. Doris loved them and that’s all that counts! Memory/memorial quilt making is always a joy and a challenge. We are so touched to be allowed to honor the person and to help keep their memory alive. It always amazes us how a tub full of clothing can be turned into an article of comfort and renewed love and joy. When someone allows us to share in the life of their loved ones, we take that responsibility very seriously and do our best to honor them with the quilt design, the colors used and of course, the final quilting, which brings the whole project together. Some of our projects have included quilts made from sparkly jeans, men shirt pockets, wool coats, and baseball caps! We’ve made wall hangings, lap quilts, king size quilts and even pillows. Go to overthetopquilting.com/memorymemorial-quilt-gallery/ for examples of our work. The baby seems to be happy with the final result which made the math challenge worthwhile! Jeanne really challenged us with this one! 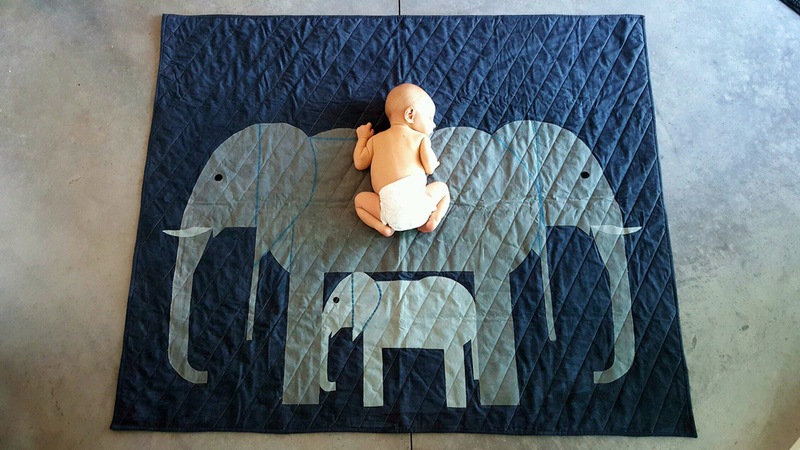 She wanted this elephant quilt wall hanging to be quited with lines indicating rain showers on the entire piece, including a very specific backing. But the lines of rain needed to be at a strict 60 degree angle. Geometry to the rescue. 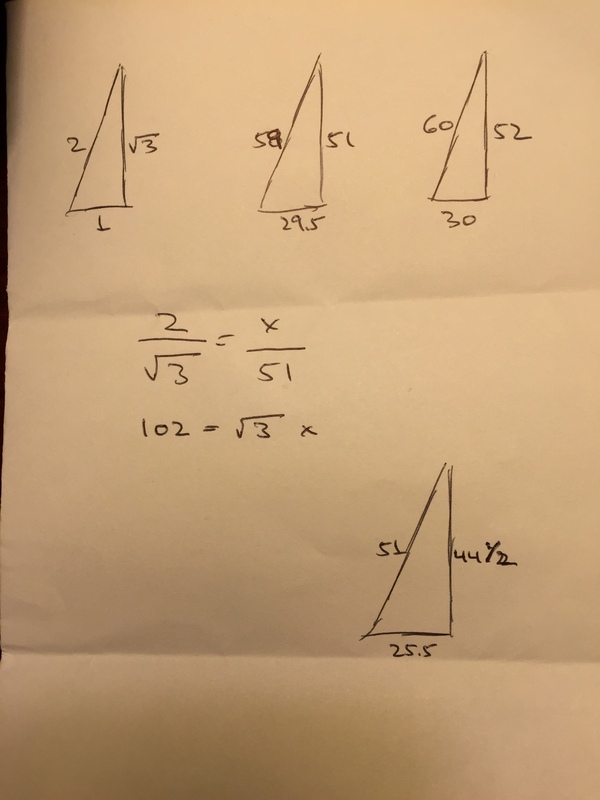 We used the formula for a 30/60/90 triangle which helped me know the proper positioning of the quilt top on the backing/batting. It was necessary to ‘pad’ Jeanne’s quilt top with triangles which ’tilted’ the piece on our longarm machine so the 60 degree angle lines were straight-across lines, Although it looked weird when loaded on the longarm leaders, the quilt was at the angle Jeanne wanted and gave me a perfectly straight line (using my APQS Millennium channel lock!). Thank you Euclid or Pythagoras (I don’t remember which). 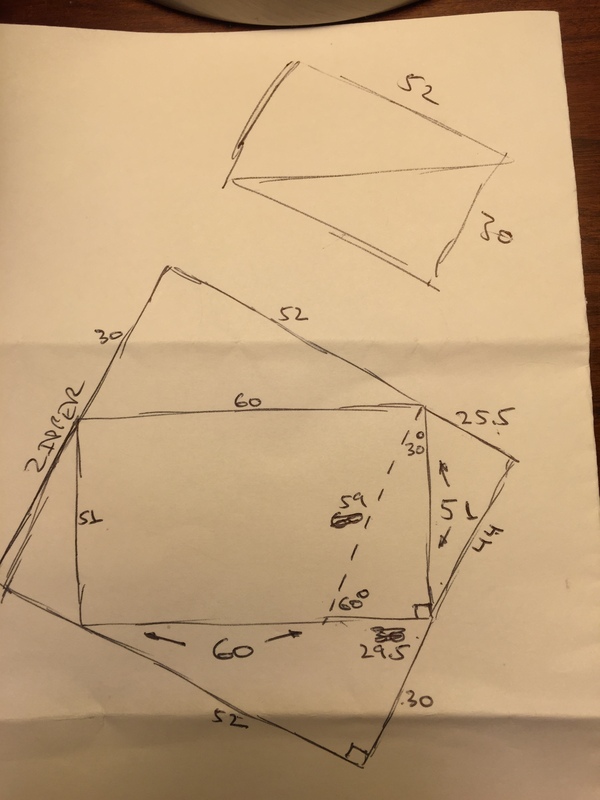 Have you ever had to use geometry to get a quilt done in a unique way? All who loves sunflowers will fall in love with this quilt! Raye designed this king size quilt herself and gave us the privilege of quilting it for her. It was a gift to her daughter. Note the intensive use of batiks throughout the top. She wanted it quilted in as elegant way as possible, with different designs in each of the separate area.s and borders, no trivial feat. She was quite pleased with it, as were we. Can you believe that this lovely wall hanging was done by Celia on her new APQS free motion, sit-down Longarm machine, George? 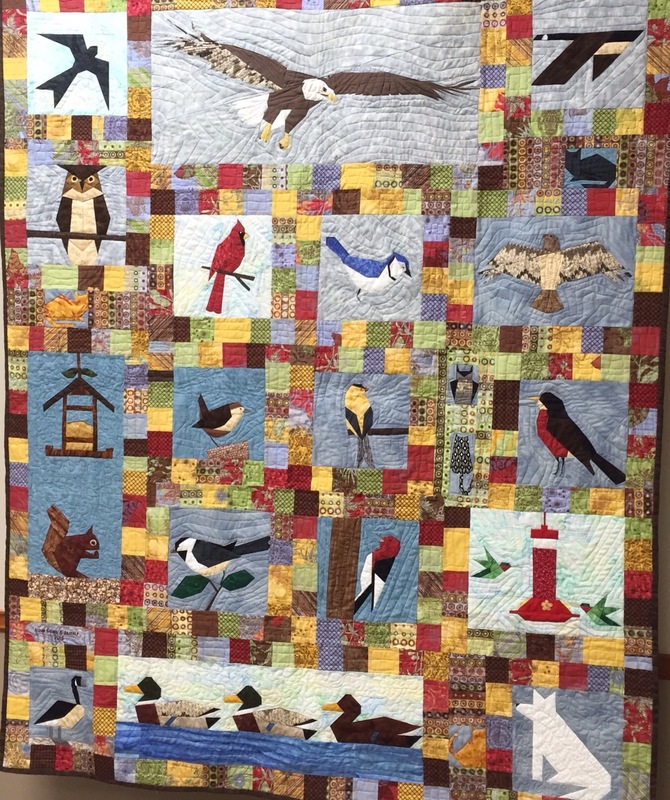 Celia and George only came together in March and she immediately put him to work on this interesting and creative piece she made for her bird-loving brother in law. I was particularly drawn to the hummingbird feeder depiction. Maybe it’s because I am rarely able to attract any of those beautiful creatures to my own feeders or maybe it’s because Celia was able to make them come alive through her inventive yet simple quilting. One more favorite panel is this one of the ingenious squirrel who seems to think that a bird feeder is solely put there for his dining pleasure! Come into the Studio to test out our George. A renting we will go! 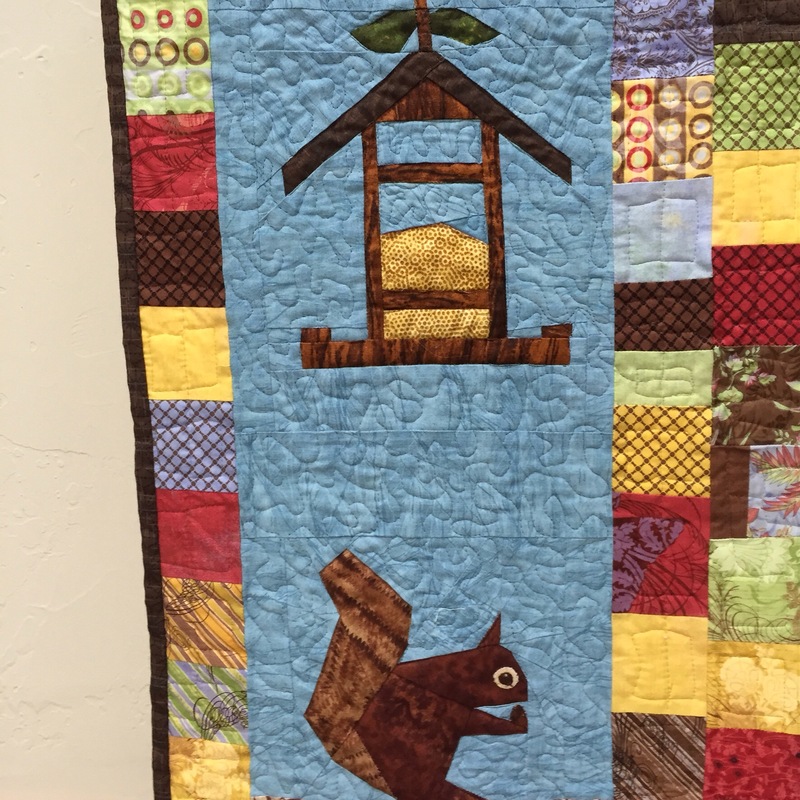 Have you ever wanted to complete your own quilts using a longarm machine? We can help you with that! Take our Rental Certification Class, finish a charity baby quilt, get some goodies and you are ready to finish your own quilt top, just like Cindy did. Didn’t she do a beautiful job? Her freehand design is so perfectly spaced and perfect for her simple practice piece. It will be well loved, too, when we donate it to an organization which support new born babies in need. Go here to get details and to sign up. We’ve opened APQS Austin – a longarm quilting studio in Central Texas! We will continue to see clients by appointment at our studio in Westlake Hills, Texas. Our new studio has 4 APQS longarm machines for you to try and to rent, longarm essentials on sale, and a classroom for us to exchange ideas and knowledge. Of course we still are very proud to longarm quilt your quilt, our quilt creation: t-shirt quilts, memorial quilts, and custom quilts. Thanks to everyone who made our grand opening a success – and a fun and educational event! For our friends who were not able to attend, here are some images from the day. A video of the Grand Opening ribbon cutting and first visitors. Slideshow of the Grand Opening – a fun event for all ages. We’d love you to come visit us at our new studio location! What a busy two weeks for longarm quilting in Central Texas! What a busy two weeks! First the grand opening of our new APQS longarm studio in Cedar Park, Texas for all of our Central Texas clients. 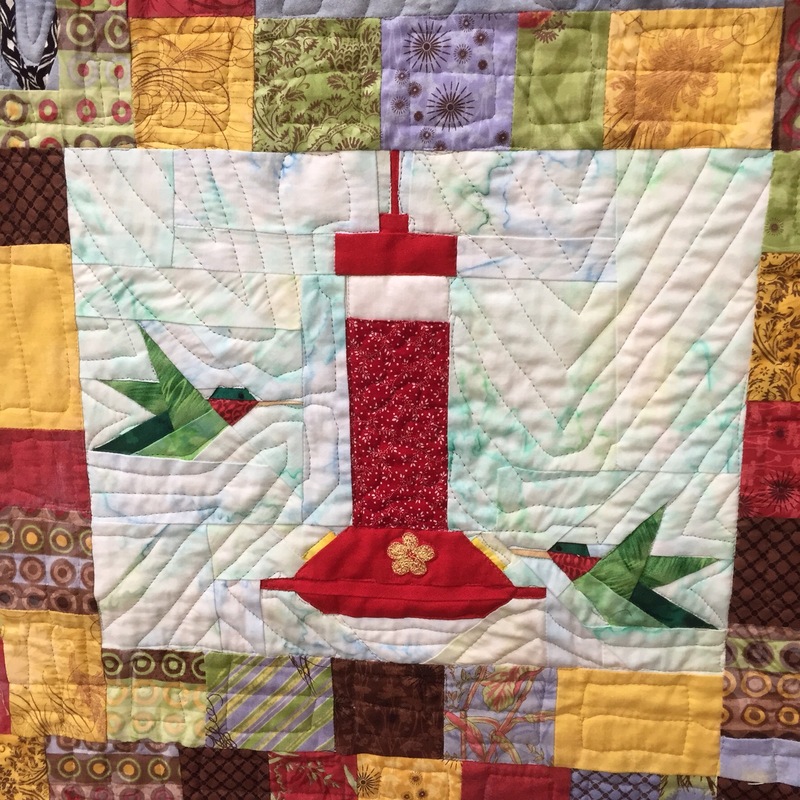 Now Quiltcon at the Austin Convention Center – Thursday, February 19th through Sunday February 21st. Please come visit us at booth 211. We like to see you and hear your experiences using longarms in unusual ways, from assembling quilts, quilting quilts, to creating quilted fabrics for so many uses. And having fun doing it. We’d love to hear what you think we should be doing, now that we’ve expanded our services for you. Chris and Susan will be there along with a number of experts from the APQS family. 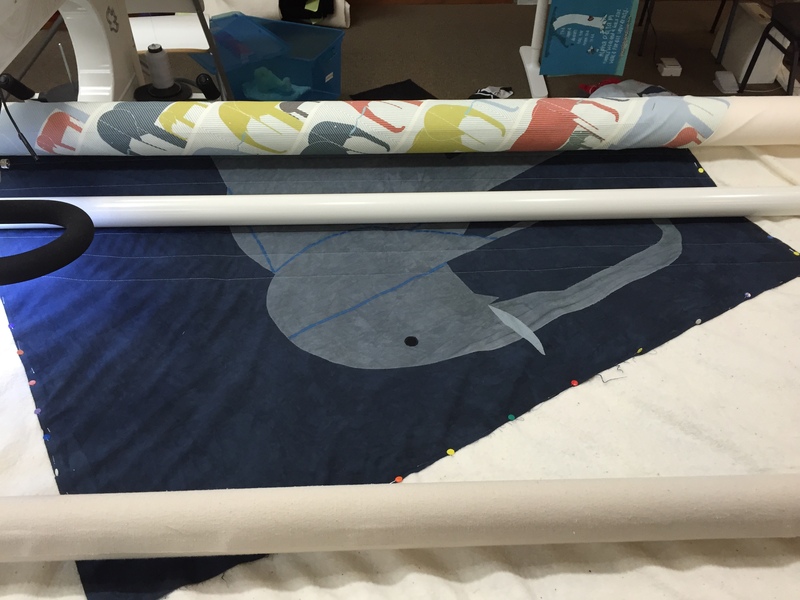 We’ll have 3 APQS longarm machines for you to see and experience. We were mentioned in the Austin American Statesman article on Quiltcon and modern quilting. We think that’s pretty cool! See you at Quiltcon?! We hope so!